For my summer field experience, I was fortunate enough to spend time at Performance Orthopedic and Sports Therapy. Dr. Matt Leonard, my preceptor, is a physical therapist, certified strength and conditioning specialist, and chiropractor. Matt has two sides to his practice, the performance side and the clinical side. With each patient he sees, he decides whether the condition is acute or chronic. 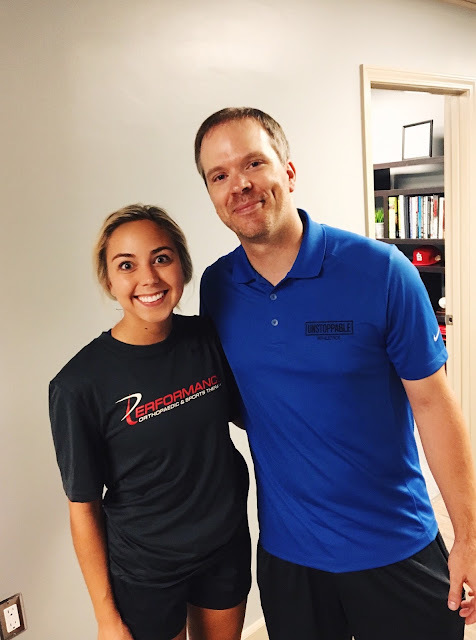 Matt uses two forms of evaluation: the Selective Functional Movement Assessment (SFMA), mostly used for an insidious onset of pain, or the Functional Movement Screen (FMS), used to sports specific testing. I was able to see how he uses these evaluations and then identify areas that could potentially be causing the patient’s pain or areas that could be prone to injury. At POST, we worked primarily with athletes that play baseball and softball. Working with these overhead athletes, we saw many patients that needed treatment for injured shoulders, elbow, and low back pain. Matt also performs strength training using a variety of Olympic lifts. I was able to learn the Olympic lifts and how each movement pattern will benefit the athletes when performing their sports. He uses a lot of functional strengthening techniques that are sports specific to baseball and softball players. He also incorporates strength training into his rehabilitation protocols. I was fortunate enough to perform my own rehabilitation with an athlete. This was an awesome experience for me that instilled confidence in my rehabilitation skills. I was also able to help with the weight training for multiple athletes. At POST I was also exposed to chiropractic manual therapy and able to observe a couple days at Matt’s Ideal Protein Nutrition clinic. At the chiropractic clinic I was able to observe DNS which is a technique used to recruit the internal stabilizer muscles of the neck, abdomen, and pelvic regions. At the nutrition clinic, I learned the benefits of starting a weight loss program that follows a ketogenic diet. This diet puts your body into ketosis, fat burning, in order to lose weight. I was also fortunate enough to observe Matt’s transition from POST to Unstoppable Athletics, his new clinic in Pacific, MO. I was able to help him move most of his weight training and rehabilitation equipment to the new clinic. At Unstoppable, Matt will continue his chiropractic treatment, physical therapy and strength training. POST has been such a great experience for me this summer. I enjoyed every day there. I learned so much about how essential evidence based practice is, new evaluation and rehabilitation techniques, more about Olympic lifting and weight training and I was even able to workout in some of the sessions! My time at POST was definitely worthwhile.